Cal Tanner is a maker of hunting pouches, haversacks, powderhorns and other items and is well known for his exceptional leather craftsmanship and quality. He has won numerous awards for his work, which, in Cal’s own words, he approaches with the mindset of a professionally-trained eastern craftsman working with locally available materials after moving to the Ohio frontier at the end of the 18th century. Jim Hays and his wife Peggy are multi-talented artists with unique ability to capture the feel of well-made, authentic looking, and aged accoutrements – including forge work, knives, pouches, horns and textiles. Cal and Jim are neighbors, working in the beautiful and historic Paint Creek Valley region of southern Ohio. They have teamed up for this year’s auction to replicate a rare surviving early 19th century pouch with a history that is intertwined with the events leading up to the warfare that erupted on the Indiana frontier in 1811. 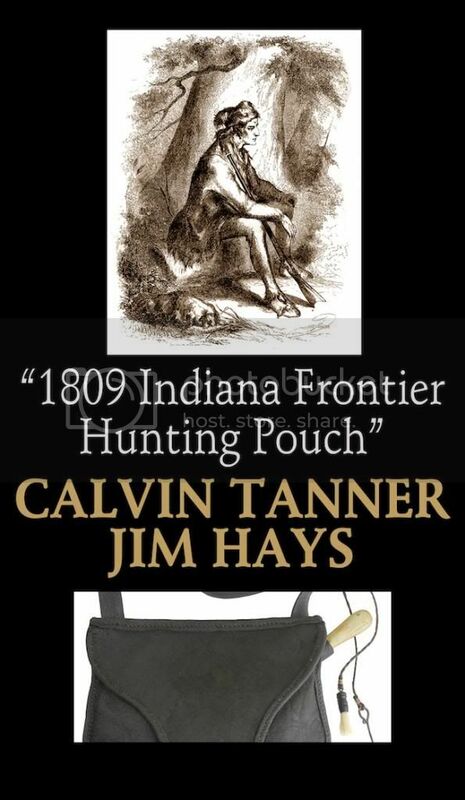 The “Thomas Simpson Pouch” and its accompanying horn, were carried and used by Simpson – a professional hunter working the present-day Ohio-Indiana border area in the first decade of the 19th century. Born in Maryland in 1773, Simpson moved with the frontier – to North Carolina, the Clinch River area of Tennessee, and by the early 1800s on to the western edge of the settlements along the 1795 Greenville Treaty Line. In the winter of 1809-1810, he moved west beyond the old Treaty line when he hired out as a hunter for the survey crew that ran the western boundary of the famous “12-Mile Purchase.” The 12-Mile Purchase had been negotiated with pro-American chiefs at the Treaty of Fort Wayne in 1809, against the wishes of Tecumseh and other opposed Native leaders – and thus was one of the first in a string of treaties and sales that led to the hostility that erupted on the Indian frontier in 1811. Simpson remained, settling in the surveyors’ cabin located in present day Fayette County, Indiana. He spent the rest of his life in the area, eventually being joined by his family and many friends from North Carolina. The original pouch set is a fitting project for Cal’s and Jim’s artistry. Beyond the regional connection, it exhibits a combination of professional and home-spun craft – extremely well made and simple, yet beautifully designed with a long pointed tail flap and an inner divider. True to the original, Cal has reproduced the pouch in oak-tanned calfskin while having the original on his bench to study. 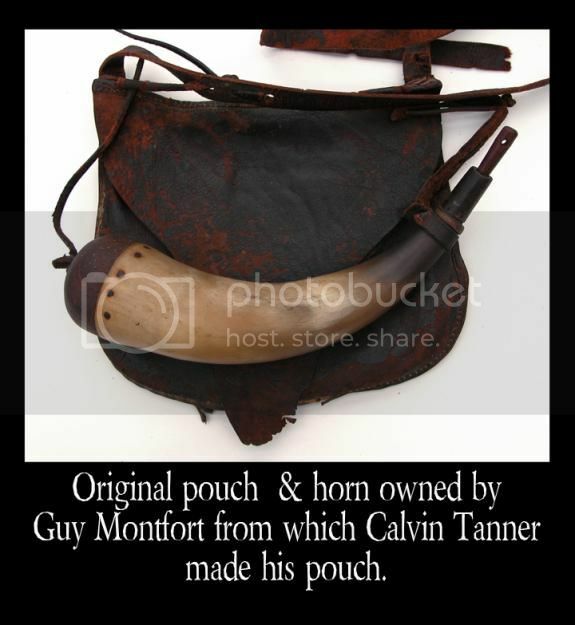 Cal also demonstrates his talent as a horner, faithfully reproducing the original horn accompanying the bag with its single raised ring, a reinforcing iron band on the spout, and a domed plug held by hand-cut wooden pegs. The worn out and replaced strap, the glassy translucence and flattening on the horn’s inboard side, and the presence of a powder measure made from a late 19th century center-fire shell casing (discovered hidden deep in the bottom of the pouch) all suggest countless miles of carry and generations of use. Jim has added a beautiful bone handled knife with a hand-forged blade to complete the set. The knife is perfectly in keeping with the strong but simple and elegant features of the bag and horn.